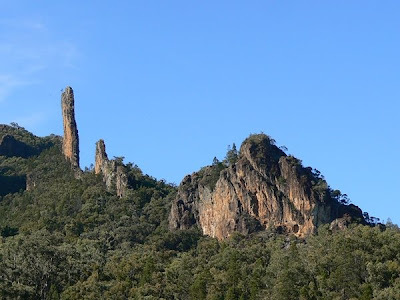 Early glimpse of Warrumbungles...... crooked mountain? That's the "breadknife" sticking straight up on the left. 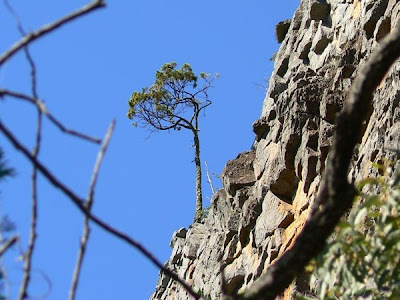 Can you see the small tree on the top? A bit to the left. Right at the top. Can you see that tree again? Just above the horizon. We have reached the mighty "breadknife". We did some awesome walks including a 6 hour hike on day 1. It was pretty solid with some quite steep bits chucked in. There were times when some members of our group (there were only the four of us) chose to slide up or down on either all fours or even bottoms! Tricky stuff. Fortunately between Fay and I we had ONE GOOD KNEE. Unfortunately for Fay I was unwilling to share it. Jan's problem was that the length of her legs made it difficult to get up and down some of the roughly made steps. Goanna, lizard, butterflies, wild goats, emus, roos, wallabies and one koala. Think that was the extent of the wildlife we came across during our stay. They are doing work up there on some of the trails - putting in extra state-of-the-art steps which ceratinly make life easier. Material had to be dropped in by chopper for the work. While there we went to the Crooked Mountain Concert (outdoor gig) with James Reyne, Felicity Urquhart, Adam Rennie and a band from Dubbo - Altitude. Turns out a few of the band attended Orana Heights Public School during my stint there. The drummer was only fourteen! Others ages between 15 and 19 I believe. Good kids even if I couldn't understand any of the words to their songs! I still remember the Stevenson kids from OHPS days. 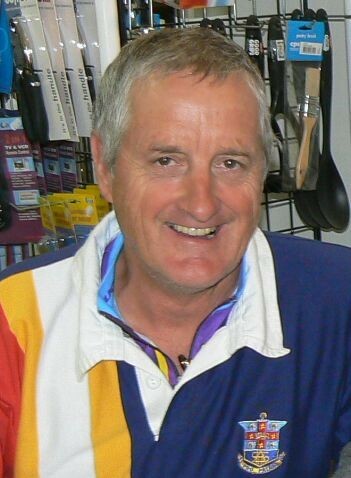 The highlight for us was certainly the Breadknife Grand High Tops Walk (the six hour dude). We camped at Camp Blackman which had power, toilets, showers and water. 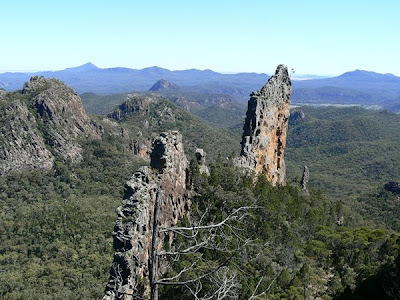 Ever been to the Warrumbungles? It was our first outing there. Won't be our last either. We walked up to and along beside the "breadknife". Awesome. Looked like you could push it over; but I didn't try. 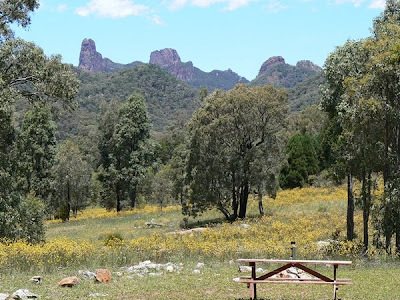 Yep, you'll enjoy the Warrumbungles Mick for sure. Maybe we'll come with you!! WHAT! No Yowies to be seen!? Very beautiful and inviting area to say the least. I am glad you had a super time. Wow what a beautiful place. Nice to see you had another good trip. i so can see the 4 of you sliding down slopes on bums, and crawling up them on all fours!!! really cracked me up dad. but you could've at least lent mum your knee for half the trip... isn't that what marriage is all about? It is a truly beautiful area. Heaps of hiking, beaut facilities and still partly rustic and rough. Believe they've done a good job of making it more accessible without spoiling it. Yes, Pete's right.... I should have shared my good knee with her! She done good eh?